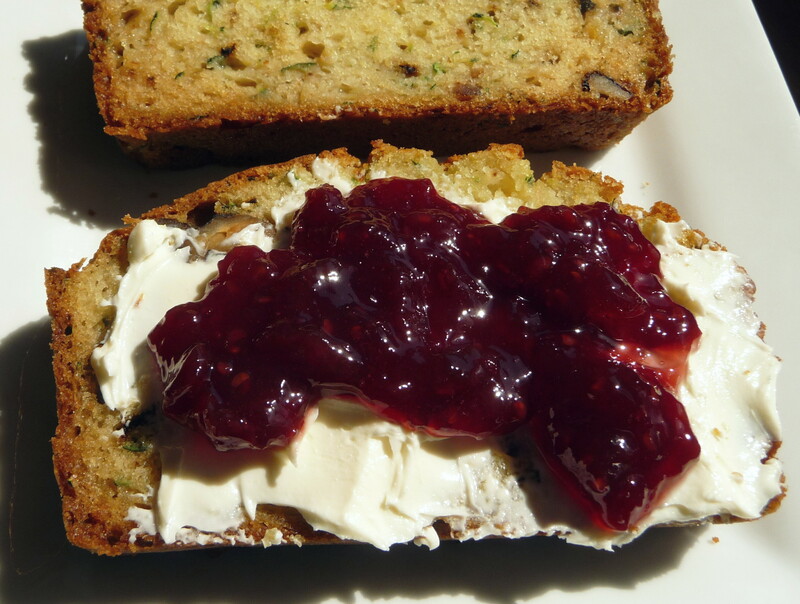 To complement the tanginess of the lemon and sour cream, I served the bread with cream cheese and my own home-made raspberry-cherry preserves. 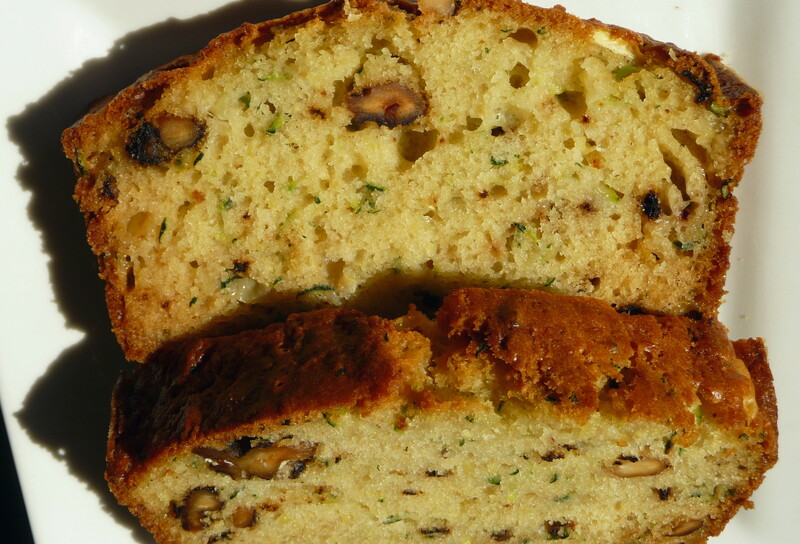 Chocolate chips would be a great addition, I believe, and might not overpower the zucchini-ness of the loaf. 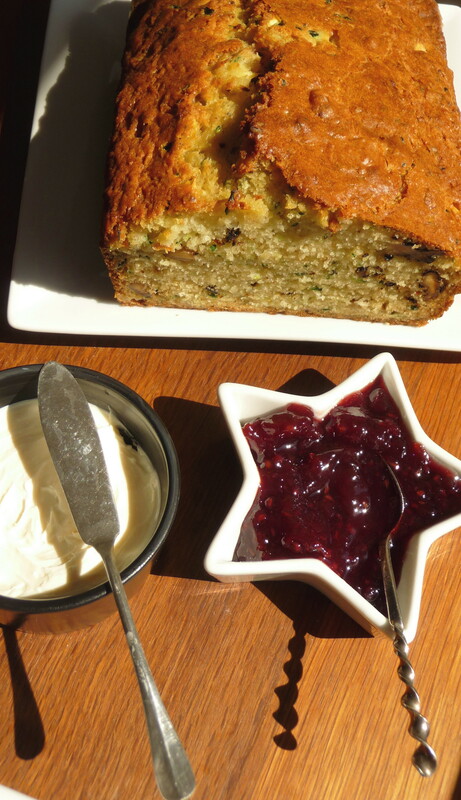 So give into your neighbours’ generosity or make good use of your own bounty by doubling up on your zucchini bread baking with this stalwart recipe. Flour and grease two 9” x 5” loaf pans. Cut off ends of zucchini and chop into one-inch pieces. In a food processor with the metal blade, chop the zucchini, watching carefully with 12 – 15 one-second pulses, with 4 tablespoons sugar. Transfer the mixture to a fine-mesh strainer set at least 2 inches over a bowl and allow to drain for 30 minutes. Alternatively, you can shred the halved zucchini (don’t cut it into I-inch pieces) on the large holes of a box grater, toss with thev4 tablespoons sugar, and drain. Meanwhile, spread the nuts on a baking sheet and toast until fragrant, 5 to 7 minutes. Transfer the nuts to a cooling rack and cool completely. Transfer the nuts to a large bowl; add the flour, baking soda, baking powder, and salt and whisk until combined. Set aside. Whisk together the remaining 1 cup plus 4 tablespoons sugar, the sour cream (or yogurt), eggs, lemon juice, and melted butter in a bowl until combined. Set aside. Pre-heat oven to 375 degrees, a bit before the half-hour draining time has expired. After the zucchini has drained, squeeze the zucchini with several layers of paper towels to absorb excess moisture. Stir the zucchini and the yogurt mixture into the flour mixture until just moistened. Place the batter into the prepared pan and smooth the surface with a rubber spatula. Bake until the loaves are golden brown and a toothpick inserted in the center comes out clean, 55 to 60 minutes, rotating the pan halfway through baking. Cool in the pan for 10 minutes, then transfer to a wire rack and cool for at least 1 hour before serv­ing. (The bread can be wrapped with plastic wrap and stored at room temperature for up to 3 days. Recipe can be halved, but why? With all the zucchini running amok, threatening to take over…. This entry was posted in Baking, Bread, Cakes, Dessert, Recipes Misc and tagged Bread, Cake, nutritious, Walnut, zucchini. Bookmark the permalink. Great post. We’ve had such a cool summer that our zucchini are slow in coming. Hope we get some! Dan, you’re doing it again, reading my mind and all that from a million miles away. 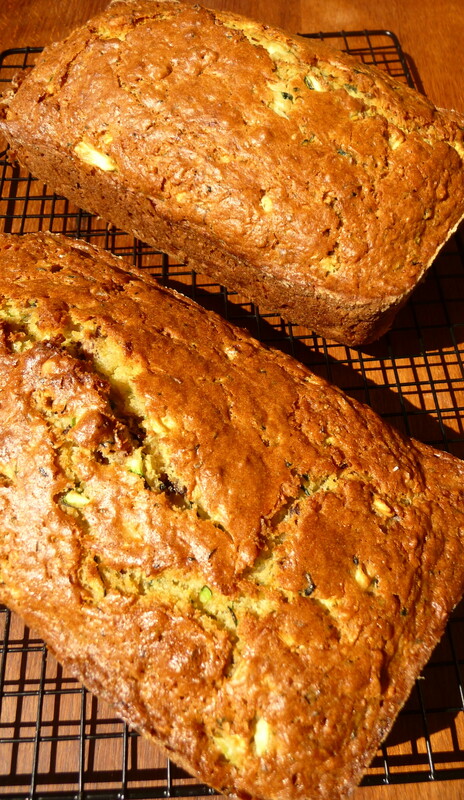 I recently was given a basketful of zucchinis by a friend whose allotment was sprouting them up all over the place in abundance, and was just thinking I should have a go at some zucchini bread to use ’em all up, and then here you go, posting just the recipe I needed. Srsly. Get outta my head! 😉 Nah, kidding, you’re welcome to be here any time if you leave such recipes as these! Wunderbar. Jax, you are hungry, not looking forward to selling any more baby thangs, and and wondering why Momma Lee didn’t think the Chiswick Thai Fair was worth more than 15 Pounds for all that good food….see, I am in your head! I know, I have had zucchinis coming out my ears lately from my mother’s garden. I love zucchini bread and am intrigued at subtracting my nutmeg and cinnamon which I do usually add so next time I have a bag dropped on my doorstep, I will try this recipe. BTW–My dad is frequently caught singing the Eggplant That Ate Chicago song. All of his grandkids know it well (as well as his grown kids)…I didn’t think anybody in the entire universe had ever heard of that movie. Hi, Geni. I think the spices are considered to obscure the zucchini character of the bread, by ATK, with the lemon juice “brightening” it further. Perhaps the question is, do you really want to taste the zucchini? If not, the spices are a good option. 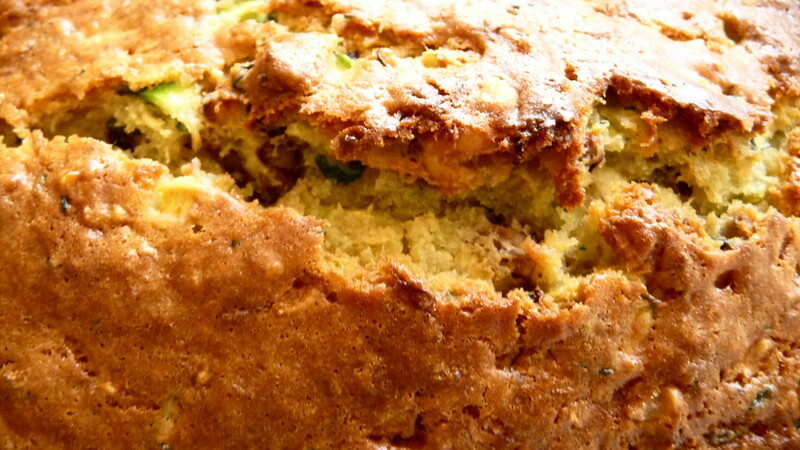 This light cake does feature the zucchini flavour. I just remember the title, “The Eggplant That Ate Chicago” from my childhood, which was in the western suburbs there. It is pretty funny yet obscure, so I didn’t expect anyone to know it! Yum! I love zucchini bread. I have always made it with lot of cinamon and nutmeg, but I’ll have to mix it up and try this route too. Thanks for the recipe. I love attack of the killer tomatoes! Too bad it takes too long to shred the veggies. It looks great. Sounds sorta healthy too. Sweeet, that sounds so cool, to receive a zucchini as a party favour ;P I adore how the folk you know share their fruits of labour. I like your zucchini breads–they look so hearty and good. It’s always so funny to me when I see veggies in baked goods, but I know it’s delicious, so it’s all good. Wow Dan, your zucchini bread looks perfect. Really. I’ve never made zucchini bread now that I think of it. I always have organic zucchini in the fridge and I grow it at my Mom’s house. Maybe I need to do this. Yeah (smile)!